This is a full step-by-step walkthrough solution for the windows flash based point-and-click room escape game. 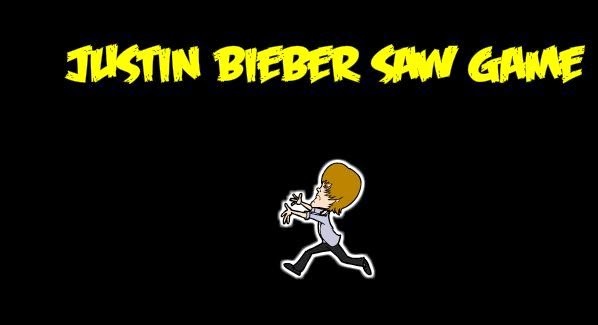 You can play Justin Bieber Saw Game here. This solution will provide detailed explanations, full instructions, and all the help you need if you are stuck. I will help you to escape alive! About Justin Bieber Saw Escape: You play Justin Bieber where you need to find ways to help the young popstar rescue his beloved Selina Gomez from an explosive finale. Grab umbrellas, glue pots and other useful objects littered around the room to help you survive the traps in each room. After the intro... (when you talk to Pigsaw and he wants to play a game, you can select any of the options). Grab the umbrella and the glue. Use the glue on the floor so that the spider will be trapped. Take the boxing shoe and the hook. Take the rope from the wall. Go out and enter the room of Chuck Norris! Take the boxing gloves with shorts. Talk to Chuck Norris and then use the umbrella on him to hypnotise Chuck. Talk to him again and listen to his stories... then select the option about shaving his beard. He will then break the door open for you. Jump through the hole in the door. Take the boxing shoe, secret weapon, and remote control. Take the robot pigsaw puppet. Use the nitro on the puppet. Open his mouth. Throw the nitro into his opened mouth. Use the boxing gloves and shorts on the puppet. Use the remote control, then walk the puppet to the next room. Enter the next room by going right. You need to be quick... use the paralyzer horn on Superman to stop him. Grab the steel marvel and air pump. Go right to Mc Donalds. Look at the soda then take the straw. Load the straw with the steel marvel. Tie the rope to the hook. Use the rope-and-hook to get the yellow Mc Donalds M.
Pick up the M then place it under the hole just left of the door. Jump on the M, then use the loaded straw on the hole. Take the deflated basket ball, then inflate it with the air pump. Take the deck of cards. Look at the deck of cards and work out what card is missing... For me it is the 8 of spades. This will be the card that Pigsaw has that you need to guess in the next room. Place the mattress on the floor on the right. Use the keypad and ente r the code then press OK.
Well done on solving Justin Bieber Escape Game. I hope you enjoyed my walkthrough solution.